The year 2016 is officially over! I calculated I spent $662 on makeup, skincare, and hair care. This is compared to $550 I spent on makeup (including circle lens), skincare, and hair care in 2015. In 2017, I'd like to save money and spend less on 'fun' purchases in makeup and skincare. 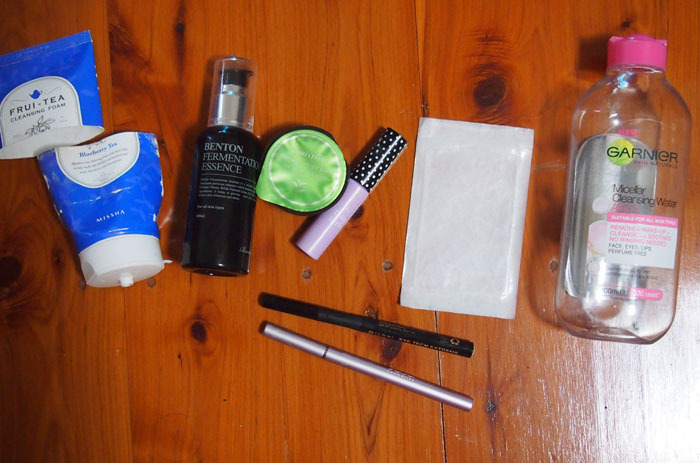 Although the majority of my money is spent on transport and food (~$2000), my main goals this year is to just repurchase skincare necessities and spend less frivolously on makeup. I have enough in my back up box for all of 2017 and probably 2018. Unfortunately, as I was taking photos of my empties today, I realised my Olympus 14-42mm lens is broken and it wouldn't zoom past 25mm. In my worry, I forgot to take a group photo of everything for the month even though I set it up that way ;( As something extra, I have posted a picture of some items that are not yet finished, but will be thrown away. 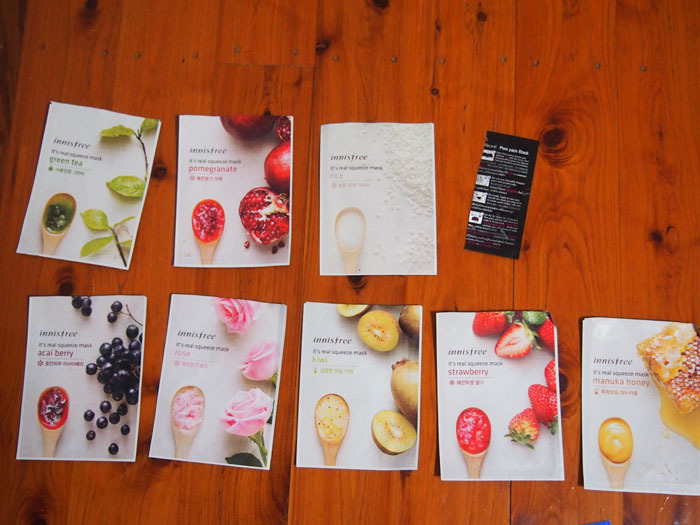 - I actually poured these sample packets into my full sized bottle. It's very thin and watery and I use it mostly on my neck as I think that this essence breaks me out if I continuously use it twice a day on my face. My neck is probably both the darkest and the wrinkliest (haha) part of my body. I thought it would be best pile the essence onto a part of my body to hope that the essence will do what it is supposed to do. It's been so-so. WNR. 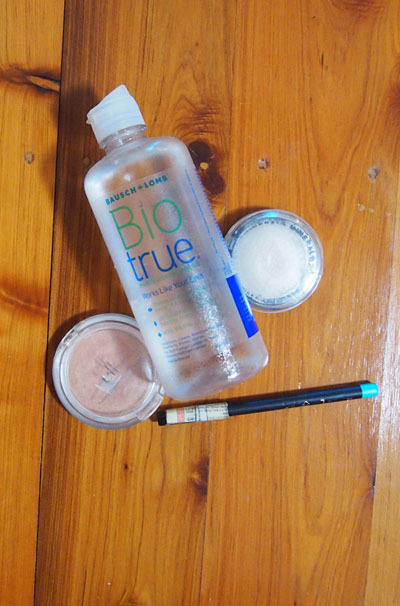 - I've always wanted to try Etude House's famous Bright Fit BB cream that got discontinued in 2014. I think this BB cream does well on its own but it feels thicker than the one from The Face Shop, but thinner than Skin79. The only complaint is that the BB cream doesn't mix in with the natural sebum in my skin and it shows not only my smile lines but mixes a little bit with my sunscreen and shows little bits of scaley cracks on my face. WNR. - My HG BB Cream. WR. - This version is supposed to have higher sun protection. I have found that the colour is a little bit different (less grey, a bit more yellow) than the Hot Pink one. Like the Hot Pink one, the Orange one is also very thick-- you definitely feel like you are wearing makeup on your face. I found that the coverage isn't quite as good as the Hot Pink and it wore off quicker. WNR. - From memory, I think the Gold version was darker than the Hot Pink version. Other than that, I couldn't recall much difference between this one and the Hot Pink one. WR. - I find that the original BCDation dries very quickly. It also feels drying on my face and exposes the dry cracks on my face. WNR. - I love this mini eyelash glue. It not only sticks on eye lashes extremely well, the glue is very easy to remove. You can peel off the glue in a strip so that your lash band is impeccably clean. Unfortunately, this formula is different compared to the full size tube version that you apply with a brush. If I could buy this full size in a tube than I would. WR. - This is supposed to be one of the most famous cleansing oils along with DHC. To be honest, I would not pay full price for it. It removes makeup similarly to my Kose oils meaning that I still need to use a foaming cleanser and a separate eye makeup remover/cleansing water to completely remove eyeliner, mascara, BB cream, and sunscreen. Interestingly, there are some sample sized versions of the full sized items I have finished this month. - Just a normal cleansing foam. I enjoyed using it. It foamed up well enough, cheap, and lasted a few months. WR. - Same as above in the samples section. - I love how this smells, like the other Green Tea products in the Innisfree line. This pack was relaxing and moisturising to use and I think it works well as a mini treat. This was good for five or so uses. WR. - Unlike the mini size, the full size was disappointing. It doesn't stick well and the glue balls up very easily. If you get any on your fake lashes... you'll have to work hard to get it out. WNR. - The best! I finished using up one of the boxes I got from Taiwan. Worth it. WR. - I love this stuff. WR. - Beautiful black and very easy to use. I think I prefer brush liners over felt tip liners though. WNR. - This is pretty, but the silver colour fades away very quickly so all you are left with is the shimmers. I used this on my waterline; surprisingly, this eyeliner is made in Korea. Etude House glitter has taken over my life. WNR. - I've had this for 11 years so I think it is time to let it go. I don't remember the last time I used it. - Contact Solution that I didn't realise expired in July whoops. I am now using a bottle that Christina gave me and that expires in May. I have two huge bottles and a travel size from the Optometrist that expires in September. - Unfortunately, I purchased this eyeshadow many years ago and the brand, the name, and the shade has long rubbed off. I do remember it being a mineral eyeshadow that Liz and I got at Priceline because they were having a buy one get one free offer. I got a white/silver one, and she got a gold one. I used it for two years and made a teeny weeny dent at the top. I doubt I will use it any time soon and it is probably eight or so years old. - Got this from Sasa because I thought it was a pretty colour. I swatched it all the time on my hand but never used it because it hurt my eye. The pencil is very hard and the colour just doesn't draw on my eyelid. Beautiful mint colour though... I have never used it in the 10 or so years I've had it so it is time to go. I am pleased to see that I made a healthy dent in my skincare and makeup collection in the year of 2016. 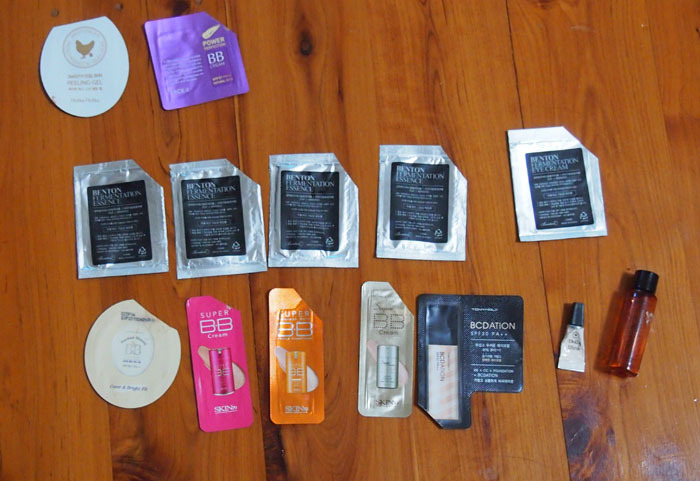 I am particularly proud to see that I have started to use up my samples of skincare and BB cream. I used to be the type of person that liked hoarding samples but never using them because I liked having a big box of samples *shrugs*. 1. Continue to make a dent in my sample collection, and maybe even finish up my entire box! 3. Hit pan on the remaining two shades of my Dolly Wink quad. 4. Finish using mini Dandelion.